Some of the most exciting additions to our services over the past fiscal year have been targeted to young adults in high school and early adulthood. In 2018, we’ve not only increased the type and number of programs created for young adults, but created a new space just for them on our main floor! In working with young adults, library staff keep in mind best practices for supporting teens as they design programs, provide learning and leadership opportunities, and create a welcoming space just for high school students. YA services are designed with the input of young adults, and are developed at the initiative of our Reference Department. Our team of teen librarians has been working hard to engage young adults in grades 9-12, and we’re excited to tell you a little more about their efforts this Giving Tuesday. Your Giving Tuesday gifts to the Foundation support our annual appeal, and help us to better serve our community. Please consider supporting the Foundation with a gift of any amount today. 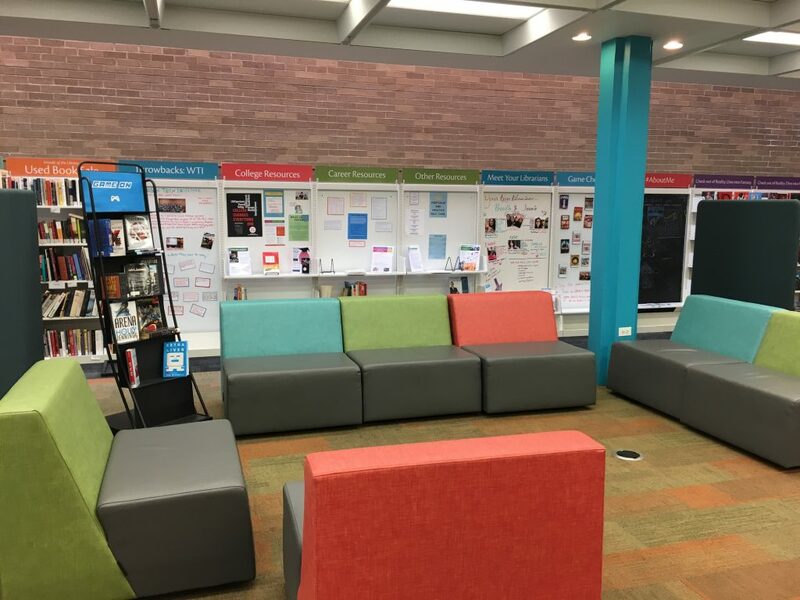 The Corner features colorful, comfortable new modular seating, and new areas for displays and featured collections targeted to young adults. A new service desk means that we can offer staffing support during the afternoons when the space is busiest, and pop-up programming like board games or creative activities means that we can engage teens in a fun way. With the new space, we’re hoping to provide a safe and welcoming place for our young adults to gather. Through the programs we offer and the materials we provide, we’re working hard to empower young adult success academically, professionally, creatively and emotionally. High school students volunteer their time twice a month to serve on the Library’s Young Adult Leadership Council. As members of the YALC, students plan programs, develop their leadership skills, serve as ambassadors for the Library at their schools, and advise Library staff on services to young adults in high school and early adulthood. The YALC members gave valuable input during our work to create The Corner, our YA space on the main floor, and have also developed and hosted their own programs – like Pajama Prom! Through the YALC, we’re giving teens the opportunity to make their voices heard and take an active role in creating the types of programs they want to participate in. This means that not only are we offering programs that they want to attend, like our supporting and affirming LGBTea Party, but we’re making space for young adults to grow their leadership skills, too. 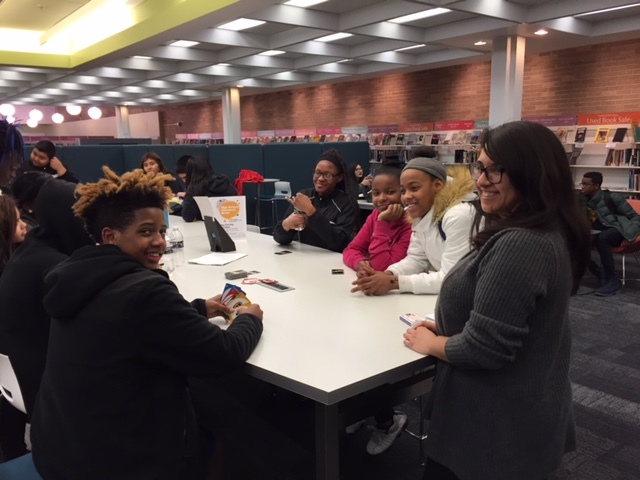 Our teen librarians also focus on supporting high school students through the college application and admissions process, even assisting students with one-to-one test preparation! One student’s ACT score jumped six points after working with library staff! Last year, our librarians supported then-WHS senior Tamara throughout the application process, assisting her with her essays and financial aid applications. Her hard work paid off: she was admitted to her top choice – Northwestern’s Medill School of Journalism – and won prestigious scholarships and awards! 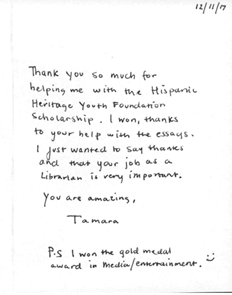 Her thoughtful and sweet thank-you note meant the world to our teen librarians, who focus on mentoring and supporting young adults through high school and beyond. With partners like ISAC, Waukegan 2 College and TRiO, we’re also able to offer financial aid and application essay workshops. Fifteen dedicated students completed this year’s Summer Coding Camp, a four-week intensive where young adults learn the basics of computer programming by learning to code in Python. WTI provides an intensive summer camp experience designed to increase participants’ academic engagement and interest in post-secondary education. Students learned computer science skills, using a rigorous curriculum, completing a variety of exercises and building their own final projects. For the instructors, college students from the Waukegan community, it’s a job-readiness program that also offers a stipend in recognition of their hard work and professionalism. WTI is also a peer mentoring program; the instructors work closely with library staff, each other, the students, and a new addition this year—a junior instructor who had successfully completed the camp last year! And students have fun, meeting like-minded peers and forming new friendships. It’s a program that wouldn’t be possible without a generous gift to our Foundation. Giving to the Library’s Foundation is easy, and your gift on Giving Tuesday will join others from throughout our community to strengthen the Foundation in the year ahead. Join the fun by giving via Facebook to tell us why you’re supporting us today, or if you prefer, make a gift through PayPal. A gift of any amount is greatly appreciated, because all dollars donated impact lives through literacy.